Bangkok/Pratunam is a star article! It is a high-quality article complete with maps, photos, and great information. Pratunam (Thai: ประตูน้ำ) is a shopping district in Bangkok. It is a major market area with thousands of fashion stores that sell wholesale with cheap prices guaranteed, especially if you buy in bulk. Pratunam is used in a broad sense here, and it also includes the areas of Victory Monument, Ratchathewi and Makkasan. The southern boundary of Pratunam is marked by the Saen Saep Canal. This canal was dug during the reign of King Rama III in the mid-nineteenth century to connect the Chao Phraya River with the Bang Pakong River to the east. When Saen Saep was connected with Maha Nak Canal and Krung Kasem Canal, a gate was required to control the water level between them. Pratunam means "water gate". It was not developed until the 1960s when rice fields dominated the landscape. Around that time, a fresh produce market was set up near the Indra Hotel at Ratchaprarop Road. Since then more markets have set up here, and the whole area has become known as a local marketplace. 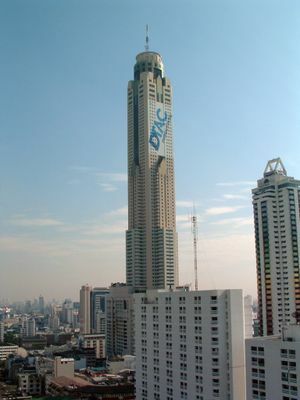 Located in Pratunam is Baiyoke Tower II. More than 300 metres high and with 88 stories, it is Thailand's tallest building and is a distinctive feature of Bangkok's skyline and represents the rising economy of both Pratunam and Thailand as a whole. Just taking the lift up the tower is an experience not to be missed. Surrounding it are plenty of other residential towers and hotels trying to make money out of the central location. But the street markets have never disappeared. Fresh produce has made way for fashion wear, textiles and accessories, but they are still sold at strictly local prices. Endless small alleyways are packed with literally thousands of fashion stores, and they are so cheap because most of them actually sell at wholesale rates. 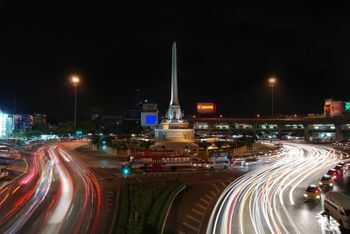 In the north of the district lies Victory Monument, a large military monument that now functions as a major traffic hub. The area became a popular residential neighbourhood for locals and expats working in the ciy centre. It is particularly lively after dusk, when there is a busy night market and an active jazz scene. 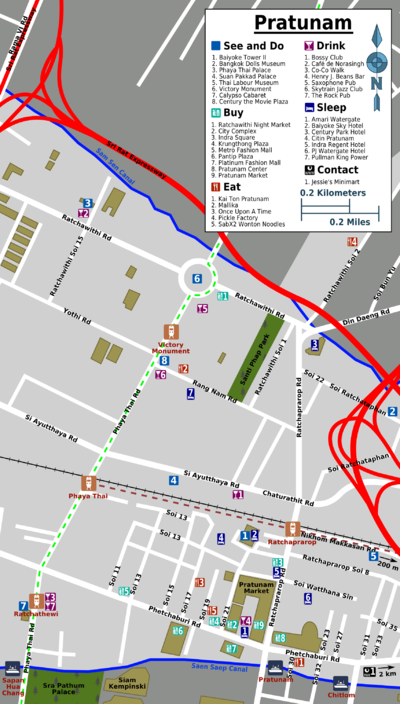 Centrally located, Pratunam is well-covered by the Sukhumvit Line of the BTS Skytrain. From Ratchathewi BTS station in the south of Pratunam, it is only a 15 minutes walk to the centre of the action (the intersection of Phetchaburi Road and Ratchaprarop Road). Phaya Thai covers the central area of the district, while Victory Monument is located in the north. At Phaya Thai BTS station, you can switch onto the ARL, but as the systems are not integrated, you will have to buy a new ticket. After many years of delays, the Airport Rail Link finally opened in August 2010. From Suvarnabhumi Airport, the trains run every 15 minutes (more frequently at peak hours), and take roughly 30 minutes to get you to Makkasan or Ratchaprarop (where most of the shopping is). It terminates at Phaya Thai, from where you can take the BTS trains. Cost is about B45 depending on where you get off, unless you take the express train to Makkasan, which runs every half hour. Besides just using it as an airport link, it is also a fine train just to get around. Ratchaprarop is the closest station to Pratunam and the Baiyoke Tower II. As you leave that station, make sure you cross the ground level railway line (which is on the same side as you come in from the airport) and keep walking in that direction. There is a sign saying "Baiyoke Hotels" nearby. Pratunam is some 200 metres on the right hand side. You walk under an overhead walkway as you come close to the area. If you're staying at Khao San Road, the Saen Saep Express Boat is your best bet to get to Pratunam. It is only a short walk to Panfa Leelard pier, near the Golden Mount in Rattanakosin, where you can get on the boat. Just step on the next boat and wait for it to have enough passengers on board. Stay put, as this will be a rough ride! Pratunam pier is actually the interchange pier of the network and right in the middle of the action. It is easy to know when you have arrived, as Pratunam pier last stop of the Golden Mount Line, so everyone has to disembark. You can also get off one stop earlier, at Sapan Hua Chang, for Ratchathewi intersection and the BTS station of the same name. A single trip takes about 25 minutes and costs 9 or 11 baht. Pratunam is one of the best-connected districts, so bus travel in general is unnecessary. An exception to this rule is the Grand Palace area in Rattanakosin. Bus 60 leaves from the eastern side of Sanam Luang (Ratchadamnoen Nai Road), passes Ratchadamnoen Klang Road (for Khao San Road) and then heads off to Lan Luang Road and Phetchaburi Road. You can get off anywhere you want along Phetchaburi Road, as it covers most of the district. After Phetchaburi Road, it goes northeast along Ramkhamhaeng Road. If you are at Victory Monument, take a 77 bus from just under the train station stairs to the right, as you look at the Monument. Is a fairly short trip of about 3Km, and should cost about B10. The bus turns left into Phaya Thai Road, continues about a Km, then turns left. Another Km brings it to Ratchaprarop Road (into which it turns right),and which is the main Pratunam road. Another Km it stops just after the Indra Hotel on your right. You wouldn't expect it, but Pratunam is easily reachable on foot. It is only a 500 metres walk north from Ratchaprasong intersection (near Siam Square). You will walk along many luxurious malls and hotels, knowing the goods you will buy in Pratunam will be much more competitively priced. There is not particularly much to see in Pratunam, unless you happen to be interested in generic-looking concrete buildings. The Phaya Thai Palace does make a nice visit if you happen to be free on a Saturday, and going atop Baiyoke Tower II gives breathtaking views of the city's skyline. 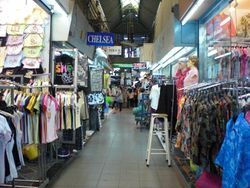 Most visitors know about the Chatuchak Weekend Market for cheap deals on clothing, shoes and accessories, but they miss out on Pratunam's daily sales. Pratunam is an excellent shopping area that can easily be reached on foot from Ratchaprasong. Most of the products available are on wholesale, so this is the place to go for some cheap bargains. Haggling is more important here than in other shopping malls, and things get considerably cheaper if you buy in bulk. Just don't forget about your baggage limit! Chatuchak has been serving a more diverse audience over the years, but Pratunam has kept a strict no frills approach. Everything looks cheap and is cheap, even cheaper than at Chatuchak. The place to head out for is the Pratunam Market, a jam-packed maze of alleys where tiny stalls are offering t-shirts, jackets, dresses, jeans, shorts, shoes and accessories, including many fakes. You also cannot miss the City Complex, a fashionable shopping mall marketed towards female teenagers and students, and Indra Square that has a more diverse audience. Shopping in Pratunam is not for the faint-hearted, as it is an unappealing area with massive crowds, pushy pedestrians and no air-conditioning. 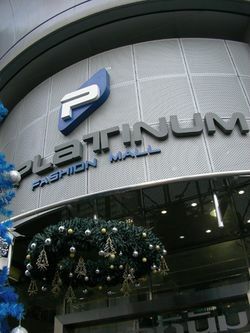 You can take a breather at the cooled Platinum Fashion Mall, that also has an excellent food court. There is lots of commercial activity going on around Victory Monument as well, although the malls are not as inspiring. Every evening, a night market is set up along Ratchawithi Road that is mostly frequented by working-class locals and students. As with Sukhumvit and Khao San, the Pratunam area also offers some of the best stores in bespoke tailoring. For more information on bespoke tailoring, see the Buy section of the main Bangkok article. Most of the eateries around Pratunam are cheap and simple, unless you step into one of its five-star hotels. The food courts of Platinum Fashion Mall and Pantip Plaza are good if you are travelling on budget. Victory Monument has the usual collection of Western and Thai fast-food favourites, and plenty of inexpensive roadside restaurants along sleepy Rang Nam Road. Pratunam quickly becomes deserted after dark, unless you're visiting the Rooftop Bar (as described in the See section). But there's an active jazz scene around Victory Monument that caters to artsy students living in the area. Expect a laid-back vibe and don't overdress. There are several hotels in the area where accommodation is available for less than B1000. Hostels costing less than B500 (per person) are also available. From the train station, there are numerous hostels to the right (as advertised), not to mention other budget accommodation as you walk towards Pratunam. Wander up a laneway on the way there and have a look. There is plenty of backpacker type accommodation here up the laneways off Ratchaprarop Road - Soi 8, about 100 metres from the Airport Link station on the left hand side has quite a few (as well as restaurants). Jessie's Minimart, inside the Miami Villa complex at Phetchaburi Soi 43/1, is an internet cafe that is open 24 hours and has a Wi-Fi hotspot available. It is close to the Phetchaburi MRT station. There's a free Wi-Fi signal at the lobby of the Amari Watergate Hotel, so you might want to have a drink at one of their cafes while surfing the net (Read more here). Another neighbourhood for cheap deals, and just a 15-minutes BTS ride north, is the Chatuchak Weekend Market in Phahonyothin. As the name implies, it is only open at weekends. Many of the shops there actually operate in Pratunam during weekdays. An alternative is the Bobae Market in Rattanakosin, a wholesale garment market very similar to Pratunam. It is only four stops away on the Saen Saep Express Boat. This page was last edited on 27 February 2018, at 16:27.